I love my Habitat for Humanity Restore, as I think I've mentioned a couple times before. They have a large inventory of well-priced ever-rotating used furniture, which is pretty much everything I've ever wanted in a thrift store. There's only one thing about the store I don't love: the schedule. My Habitat store is open Wednesdays through Saturdays, but accepts donations on other days of the week. That means that 10 AM on Wednesday is when they have their best inventory. I know this. In fact, everyone knows this, as evidenced by the giant crowd that can be found outside the doors every Wednesday at 9:55 AM. It's a free for all. 70-ish antique dealers, furniture flippers, and the occasional homeowner running around trying to grab the best finds before anyone else. It's stressful, and frankly, I only go at that time if I'm looking for something specific. Small? Check. Space underneath? Check. 100% wood? No!! Not check!! But I didn't realize that until I got home. 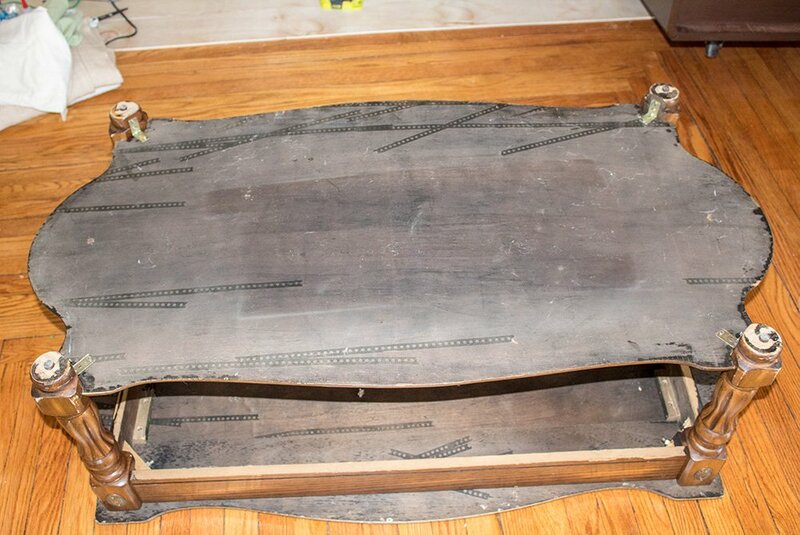 I blame the crazy Habitat atmosphere for my temporary inability to figure out this was a veneered piece. Looking now, it seems so obvious. 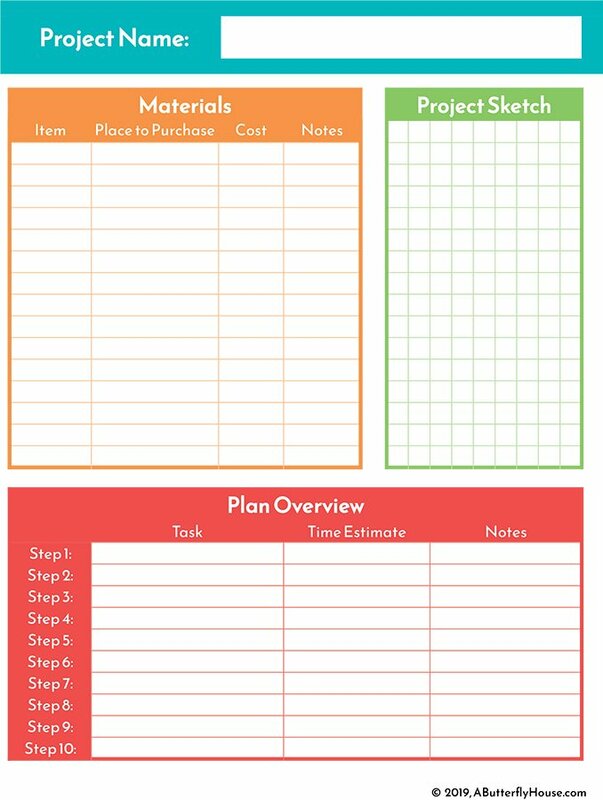 Don't make my mistakes: actually print out the Thrift Store Shopping Checklist (free below) so you make sure to get the right piece. Want to master thrift store shopping? Click below to grab your FREE Thrift Store Furniture Checklist, so you know you're purchasing quality used furniture every time! 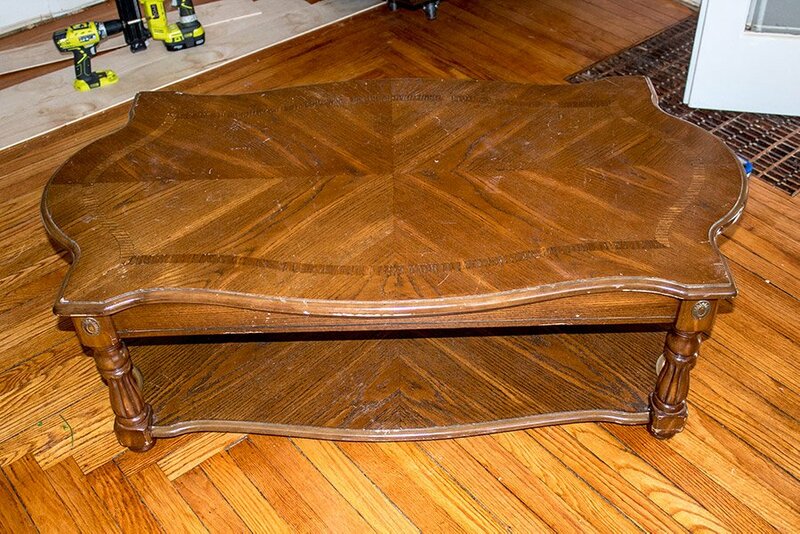 Regardless, I paid $15 for this little coffee table, so I was determined to make something out of it. I did, and actually, I'm pretty pleased with the result. Wood for Tabletop- I purchased five four foot 1" x 6" pieces of premium pine to make into the tabletop. 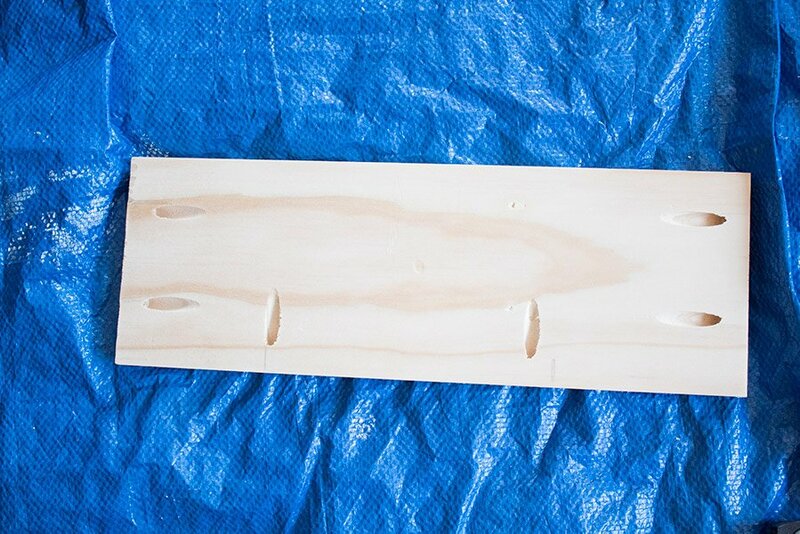 Note that pine stains poorly, so I used wood conditioner and did a lot of testing on the scrap pieces before staining. It cost around $60 from Lowes for the wood. Lift-Top Hardware- The set I purchased was actually my second set of hardware- the first was too large to fit in the small space. I'm pretty happy with them so far (especially for 20-ish dollars,) and they were easy to install despite the lack of instructions. Everything else I had around the house. 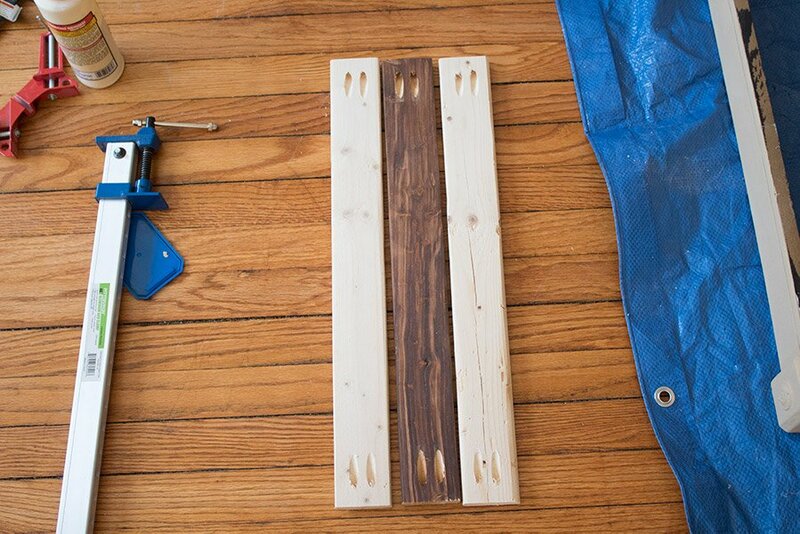 This includes scrap wood, wood glue, stains and paints, nails, and screws. When I flipped the table over, I was pleasantly surprised that it would be easy to take apart. The lower level was only held in by angle brackets and screws, so I had those off in a few seconds. I toyed with the idea of cutting the lower level into something rectangular, but didn't want the hassle of trying to clean up the edges, since they'd be visible. Instead, I added both the top and the lower level to my assortment of scrap pieces in the basement, to be used on another project later. This was the most labor intensive part of the process, taking me a couple hours to cut and assemble the pieces. 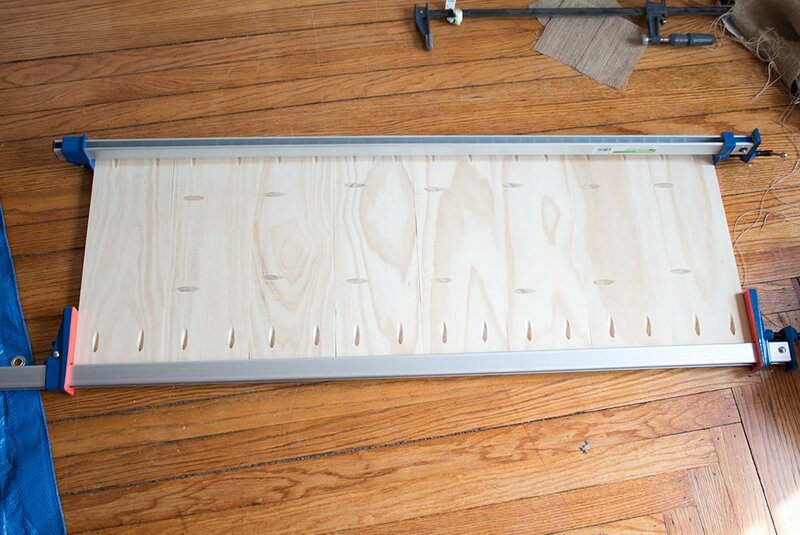 I wanted the top to be slightly larger than the frame, so I aimed to make the top 44" long by 27" wide. 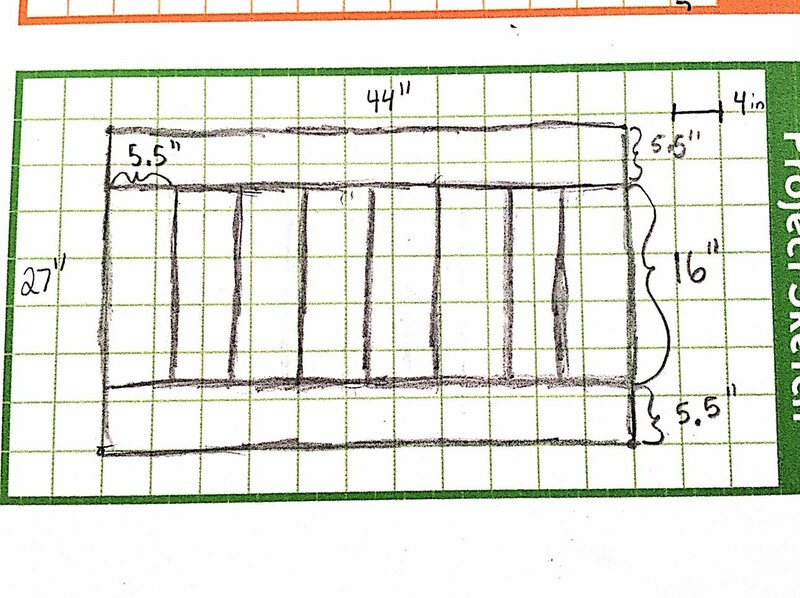 See the sketch below for each board's measurements. I started with the middle boards, cutting them all to be 16" long, and adding two kreg jig holes to three sides in 7 out of 8 of the boards. 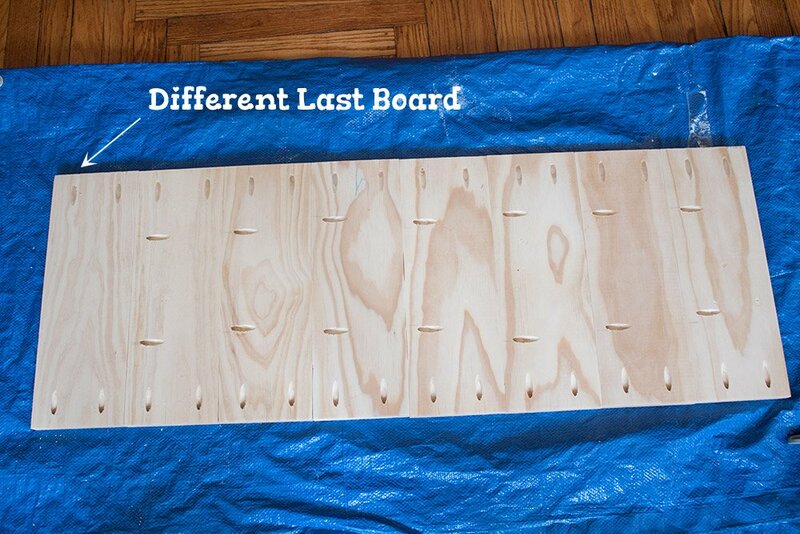 The last board only had holes on the ends. 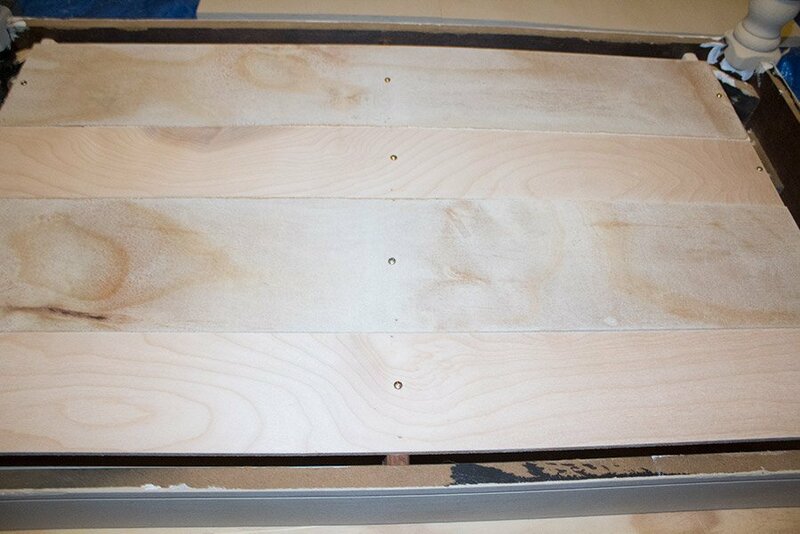 Then I used wood glue and kreg jig screws to attach the boards together. Clamps are important here, FYI. Only after these eight boards were glued and screwed together did I cut the long pieces to go on either side. This way, I cut the long pieces to match exactly the length of the tabletop. Turns out, this table is 43 7/8," so that's what I cut my long pieces to. 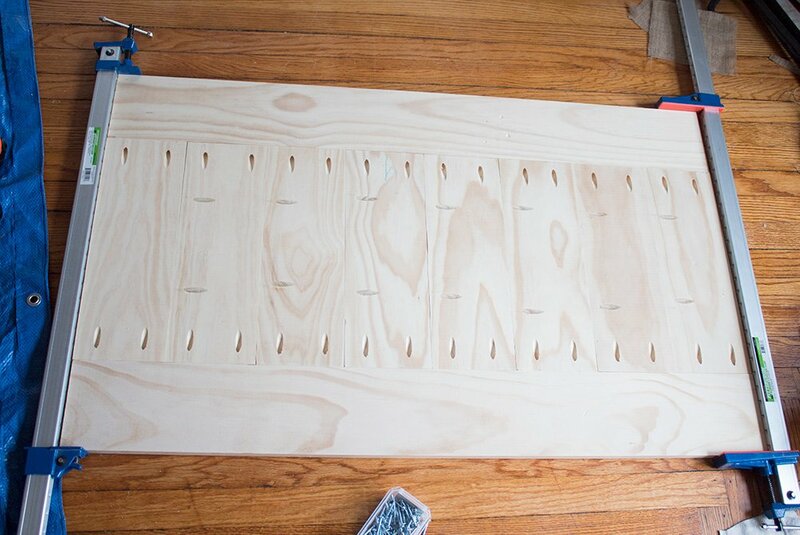 As you could probably tell from the above photo, I didn't drill any new Kreg jig holes in the long boards. 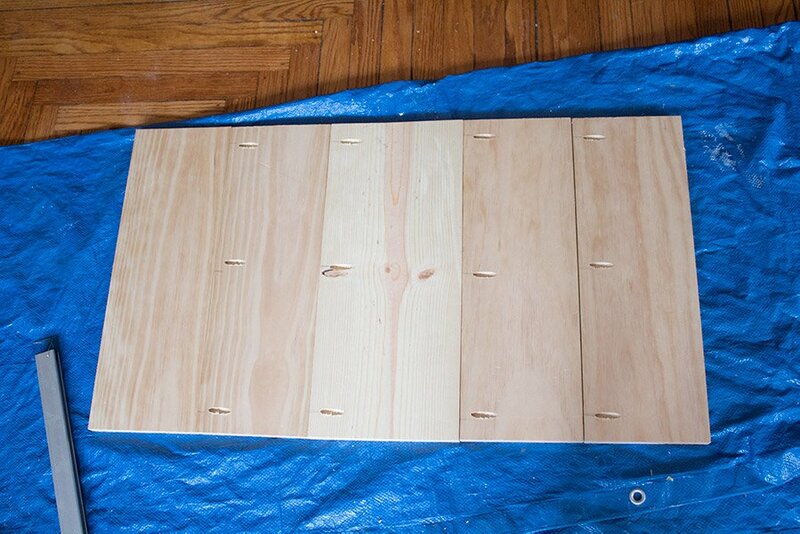 Instead, I just used the holes I drilled in the earlier boards to attach everything. The number of screws I used may have been overkill... but hey, it's sturdy! 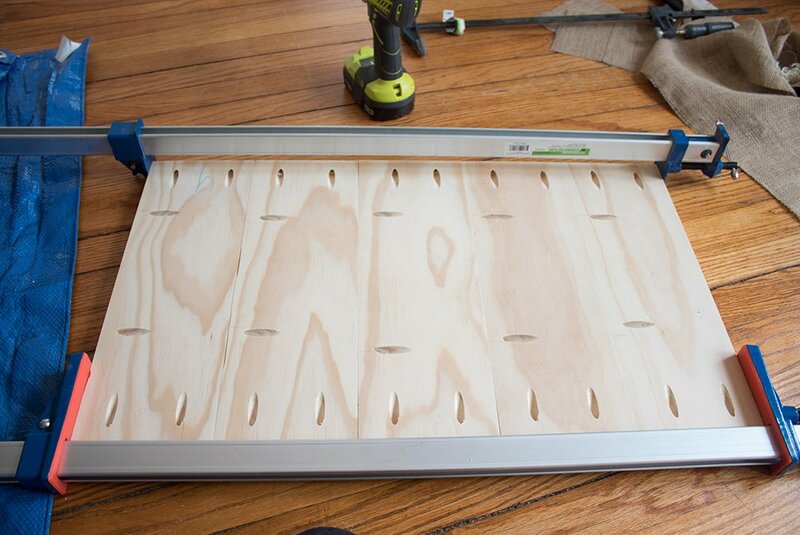 For the lower tabletop, I repeated this exact same process with scrap wood that I had in my basement. I knew I was going to paint the lower level, so I was less concerned with picking nice boards that matched. The lower level was smaller than the upper level, since it was inside of the table legs. 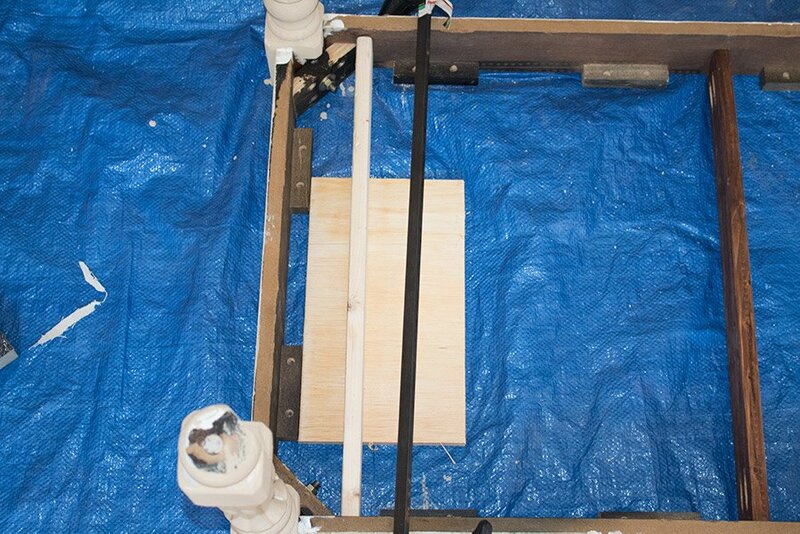 I specifically cut (and chose which boards I used) based on the distance between the table legs. 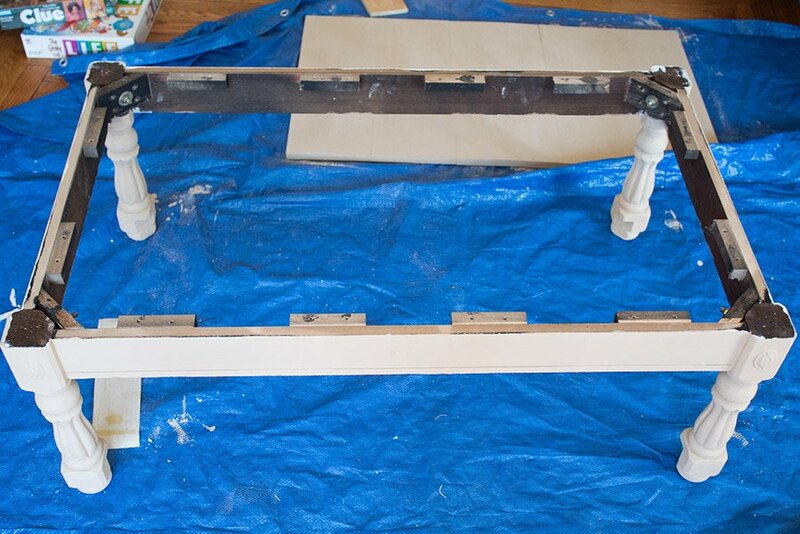 I decided to paint and stain each part before assembling since it would be easier to access all of the areas. For the painted parts, I started with two coats of Zinsser's Oil-Based Primer, since I wanted to make sure the paint would adhere to the veneer. 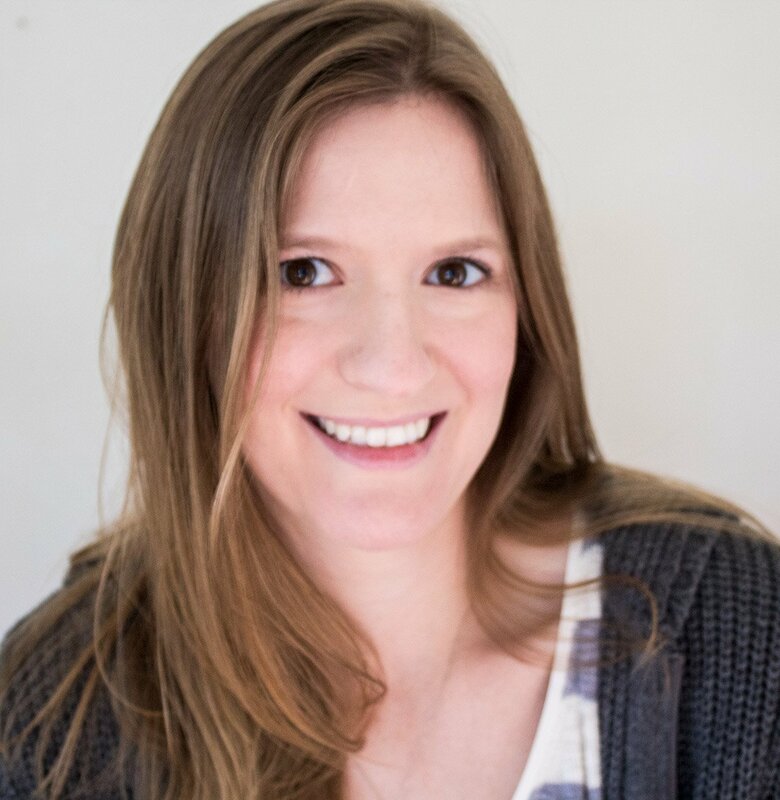 I wish I could tell you exactly what paint I used, but it was a mix of some leftover white latex paint with some leftover burlap-colored paint (from my burlap walls project,) that I then mixed with baking soda to make into chalk paint. 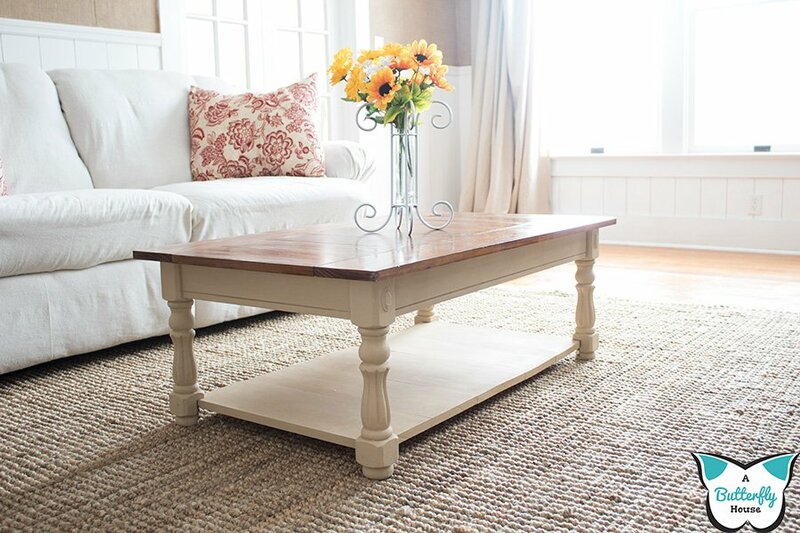 Something to know: I'm not a huge chalk paint fan, mostly because I prefer a more semi-gloss look in my own home. Plus, that stuff's ridiculously overpriced, and I have better things to spend $30+ on than a quart of paint. However, this DIY baking soda thing had me sold. It was cheap (aka, free, since I already had baking soda,) easy to mix, and adhered well. So well, in fact, that it didn't seem to chip easily, so if you wanted a chippy look, maybe try something else? The texture was super grainy after it dried, but a quick sanding solved that issue. It was so much of a win that now I'm wondering what else I can paint with this baking soda chalk paint stuff. If you too want to give it a try, I mixed 1 cup latex paint with 3 tablespoons water and 1/2 cup baking soda. 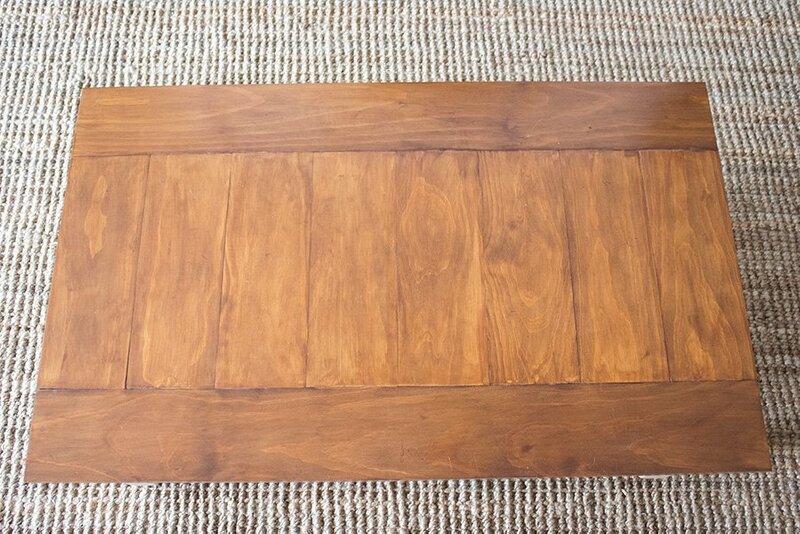 For the tabletop, I used wood conditioner, then stained with two coats of Cece Caldwell's Hickory stain. I bought this stuff years ago when I was trying to get a very specific look. It's pretty expensive, and honestly, I'm not sure it's worth the price. That said, it works differently than most stains (you don't wipe it away,) and seems to do a better job on pine than more traditional options. Despite the fact this stain claims it's "stain+finish," it still felt raw, so I added two coats of Minwax's Tung Oil once the stain was dry. 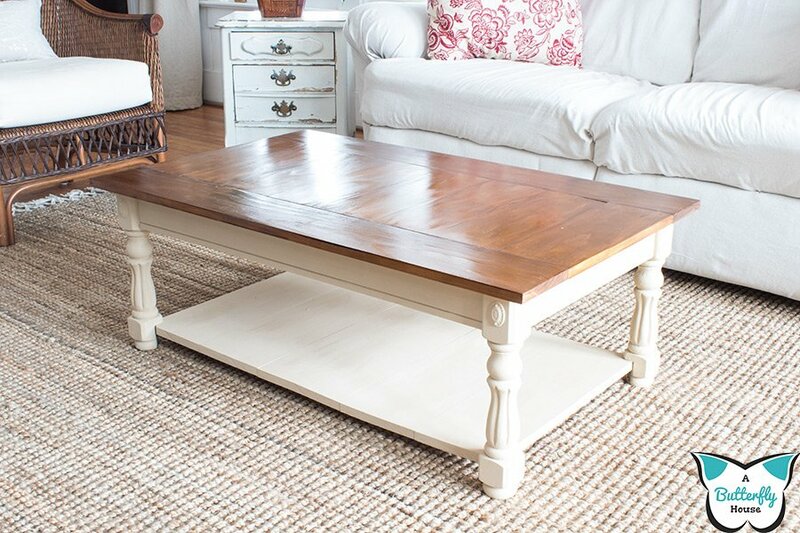 I decided this coffee table would be even more handy if it had a small storage area underneath the top. To do this, I'd need a couple things: 1) some structural supports to hold the bottom of the storage area in place and 2) hardware to lift up the top. 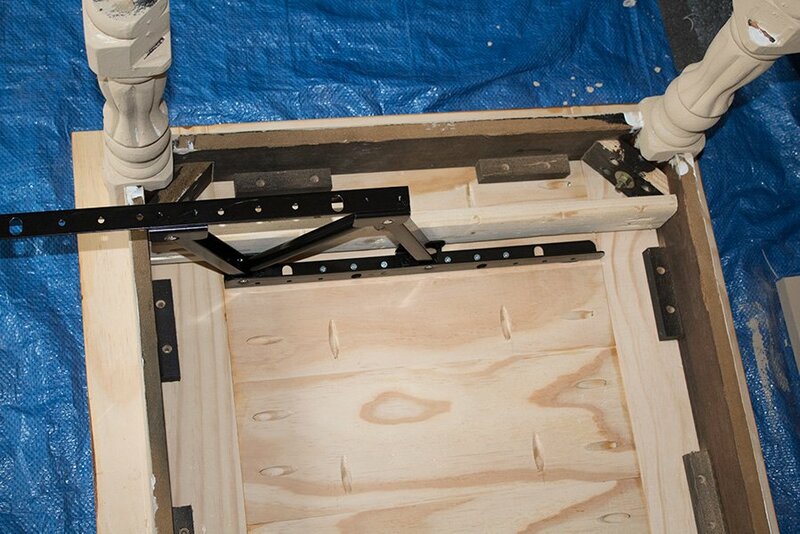 I purchased this lift-up mechanism from Amazon, and while I waited for it to arrive, put some supports in place. The supports were some old 1" x 3" furrings strips I'd found in the basement. One had even been used as a stain-testing board, but since this was inside of the table, I figured it didn't matter. 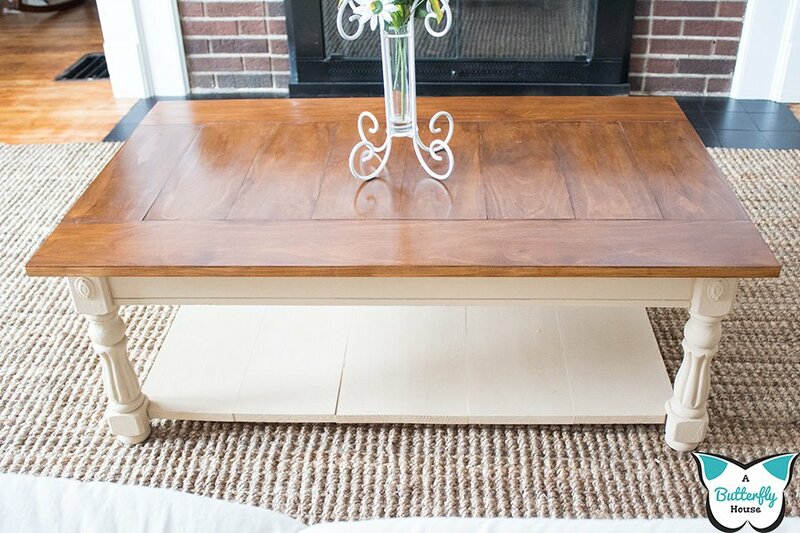 I cut them to the inside width of the coffee table, then added two Kreg jig screw holes on each end. Then I flipped the leg/frame piece over, and secured the strips on each end (with one in the middle) using Kreg jig screws. Obviously, this little area is going to need a bottom, however, if I attach the bottom before attaching the tabletop, it will be difficult for me to install the lift mechanism. Therefore, I waited to install the bottom until after the tabletop had been connected. 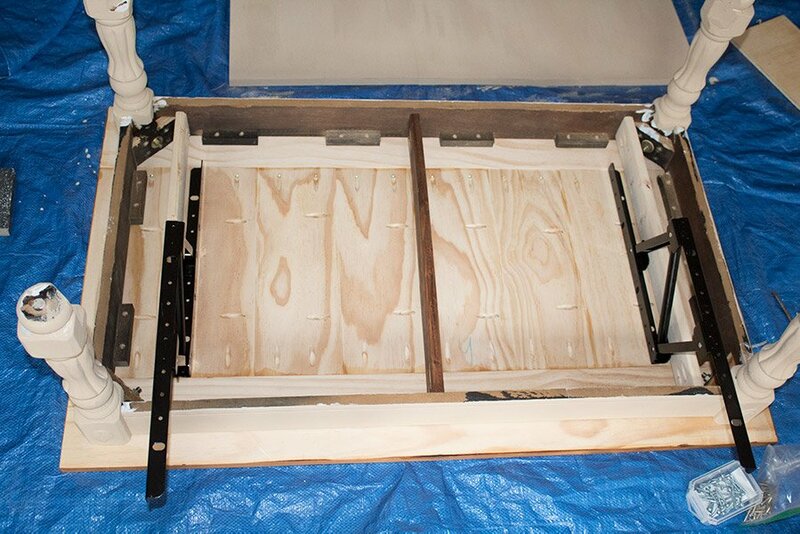 Once the lift mechanism arrived, I could install the tabletop! I flipped the tabletop over, and put the leg/frame on top. The lift mechanism did not come with instructions, so I took an educated guess at installing it. I opened the mechanisms and placed them into place on the table. 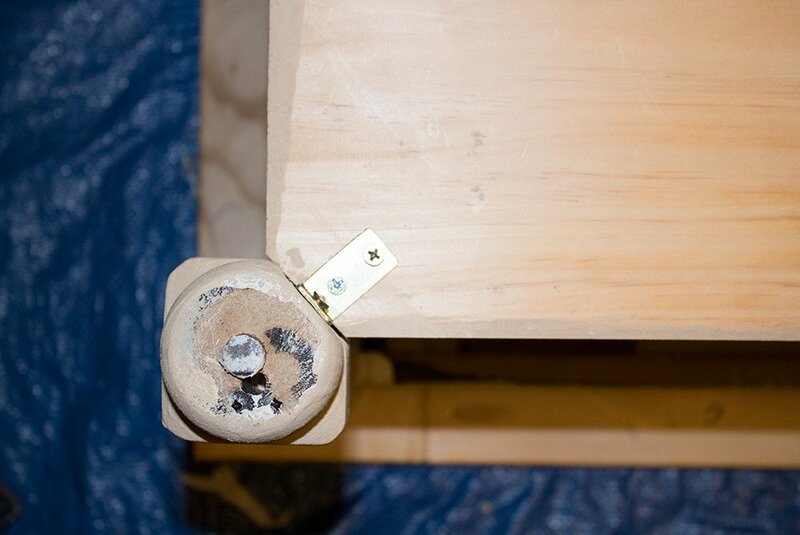 This allowed me to access the holes in mechanism and add screws that attached the mechanism to the tabletop. See below. 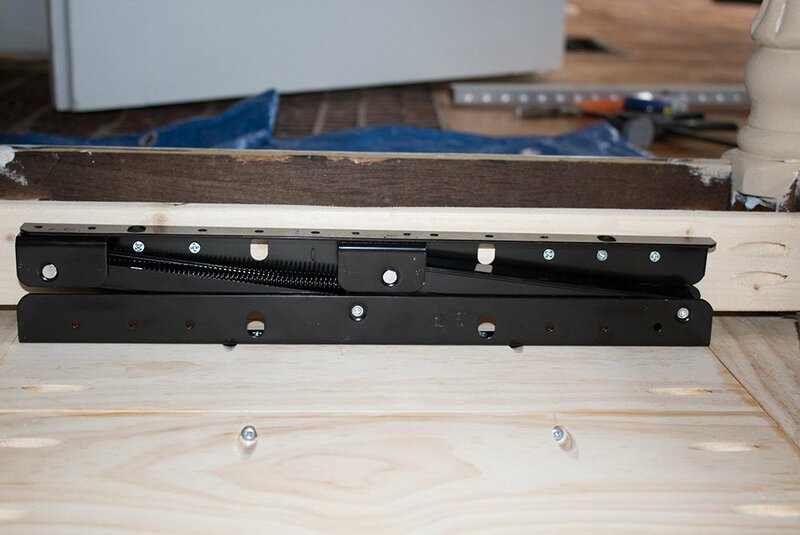 Then I closed the mechanism and attached it to the furring strip frame I'd added. Then I could finally close up my storage area! I cut some 1/4" strips of plywood (leftover from my plywood floor and wainscoting projects,) to the correct length and nailed/screwed them to the furring strips. If you can't see from the photo, there are two nails and a screw at each furring strip point. I had originally planned to use 1 inch thick scrap boards for the bottom of this area, but I decided to go with the scrap plywood instead. It's cheaper, and I could save the 1 inch boards for something where I really needed the support. 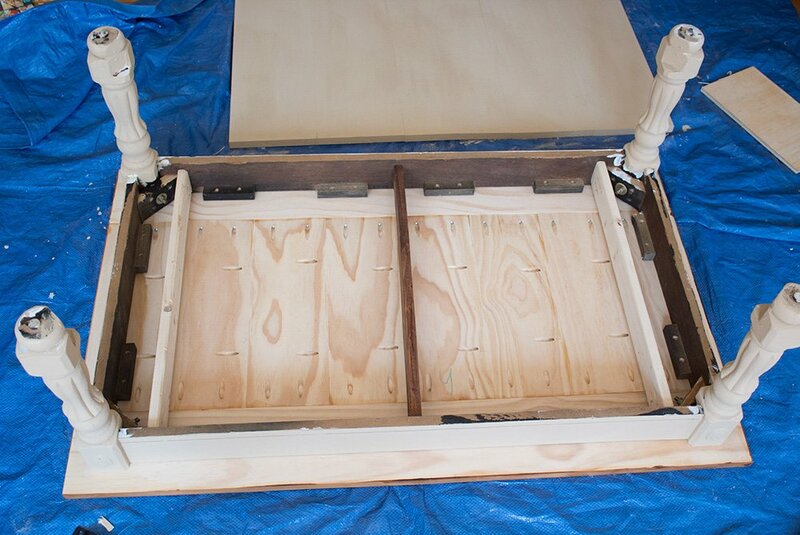 I'm not planning to store anything too heavy in this compartment, so the 1/4" plywood should be strong enough. 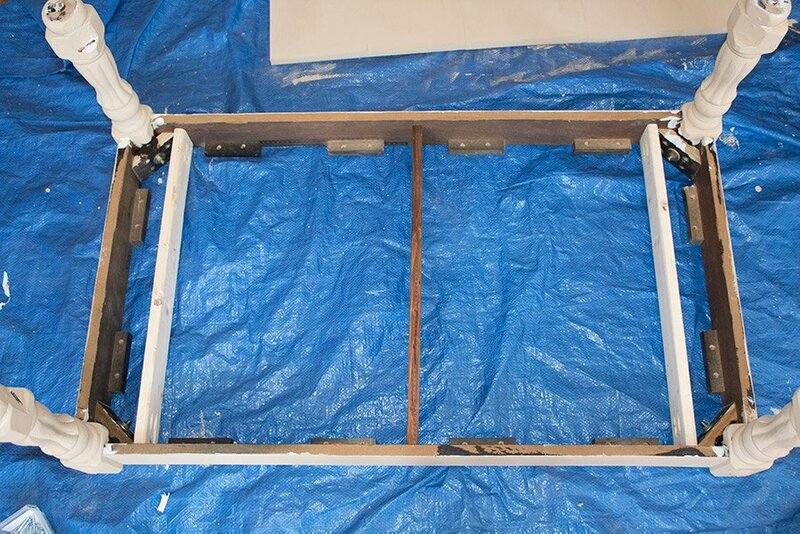 Lastly, I attached the new bottom level to the frame. I cut a little triangle off of each corner, then secured it in place with the original angle brackets. Despite this seeming like the longest tutorial ever, this project didn't actually take that long to do. I maybe spent five hours working on it total, although it was spaced out over a week while I waited for the lift mechanism to arrive. And if you're wondering why I didn't just build a whole table from scratch instead of starting with the existing frame, there are a couple reasons. First, this was cheaper. Wood is expensive. Fancy table legs are expensive. The fifteen dollars I spent for the frame was still probably cheaper than the cost of creating that frame from scratch. Secondly, this was easier. 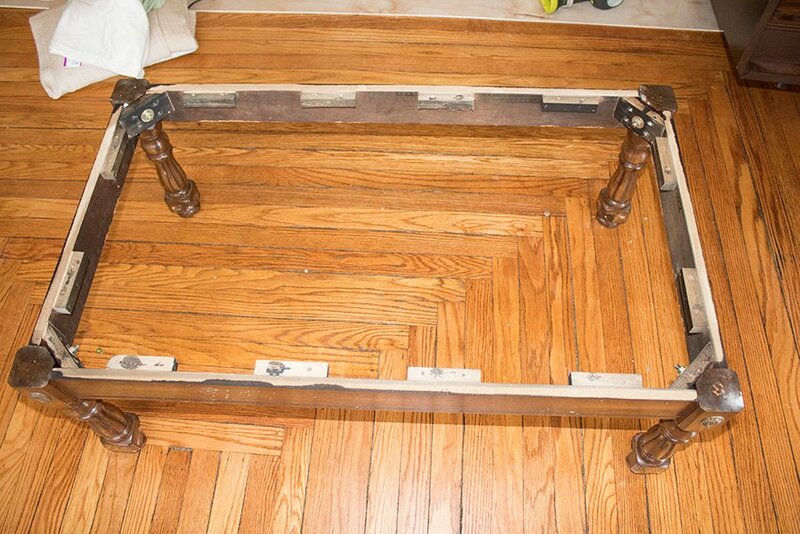 I didn't have to worry about making sure the frame was square, or that the table was level. 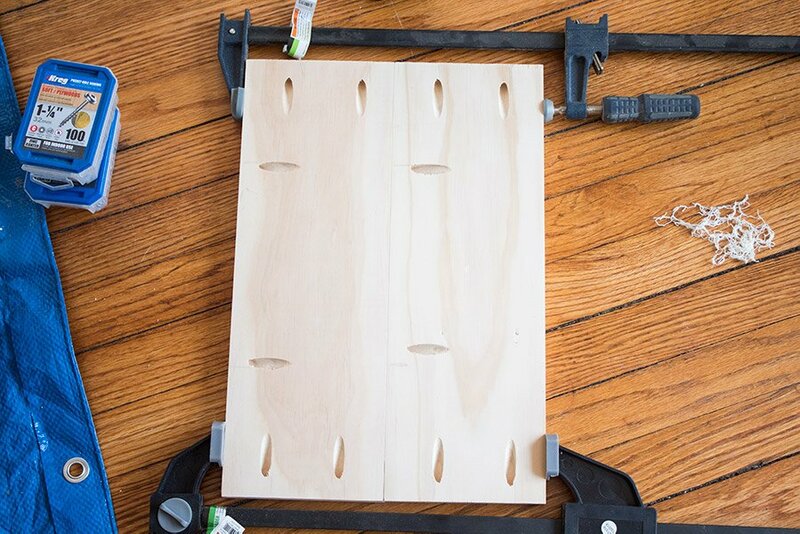 The hardest parts of building furniture were already done for me. Regardless, I love the way it turned out, even if I was a little sad when I brought the original table home from the store. 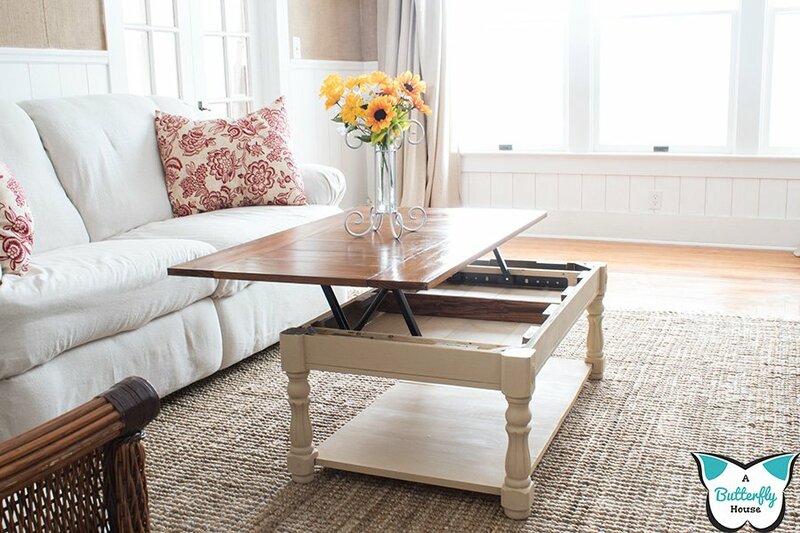 It fits well into my slowly-coming-together living room, and provides some extra easily accessible storage too! 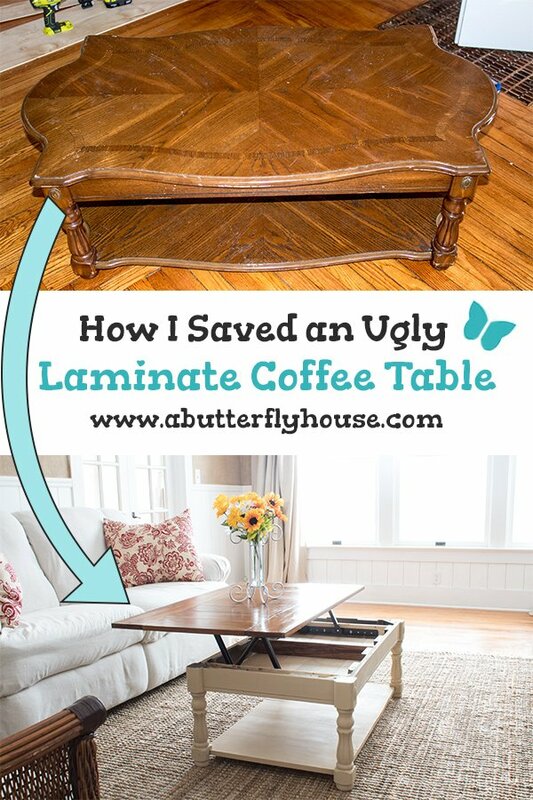 If you loved it too, go ahead and save this post to Pinterest so you can find it again later! Grab your FREE! 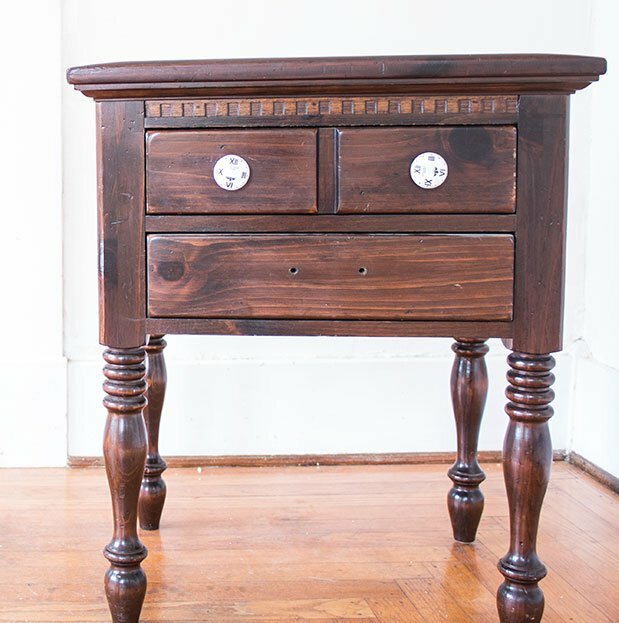 guide to Thrift Store Furniture Checklist below.